Hot weather means cold treats. Celebration time means sweet treat. Pamper me time means indulgence. Usually one cannot indulge in a curry or roti or rice. It usually means a sweet treat…. chocolates, ice cream, dessert etc. Whatever the reason, sweets and desserts are always a welcome treat. This recipe didn’t get blogged when it was suppose to but better late than never. I made the mousse when I was writing out the wedding invitations. Instead of a typical indian sweet treat like ladoos, barfi etc I decided to make a mousse with a bit of all the goodness of typical Indian spices.This gave me the opportunity to try the recipe I had bookmarked for ages, Tarla Dalal’s thandai mousse. There definitely was a good reason why this recipe never got blogged before I went off to London for the wedding preparation. The reason is very clear today. Also this is my 400th recipe on my blog and its fitting that I honour my favourite Indian cook,chef and recipe writer Tarla Dalal. I repeatedly state that I learnt how to cook from my mum, kaki (chachi) and my mother in law. The other most important teacher in my life has been Tarla Dalal. She opened doors of exciting cooking of different cuisines for me. Pasta, pizza, north indian dishes, salads and eggless cakes from Tarla Dalal’s books were some of the recipes I had experimented with when I was just 16. Coming to the recipe, I made a few changes to suit my needs but I loved the mousse and so did my guests. This mousse is made using agar agar. So its suitable for people who do not eat gelatin. Put the almonds in a wide pan over low heat. Roast the almonds for 3 to 4 minutes. Add the rest of the masala ingredients and roast for a minute or 2. Process it into a powder using a spice mill. Store the masala in an airtight container. Whip the cream till it is fluffy and soft peak consistency. Keep it in the fridge till required. Heat ½ cup milk in a pan over medium heat. Add the agar agar and stir till it dissolves. Add remaining milk, saffron, thandai masala and sugar. Stir the mixture till it becomes cold (room temperature). Add the whipped cream and whip to mix. Pour the mixture into containers. Let the mousse set in the fridge for 1 to 2 hours. Decorate with chopped nuts and serve. Add 1 ice cube to the hot milk mixture to cool it down quickly. It is important to stir the mixture while it cools otherwise it will begin to set. Store the extra thandai masala and use it to prepare thandai drink. Ready made thandai syrup already contain sugar. So taste the mixture before you add any. Thank you for sharing it with Favorite Recipes Event! Congrats on your post. Yummy mouse. Thanks for linking. wow…. 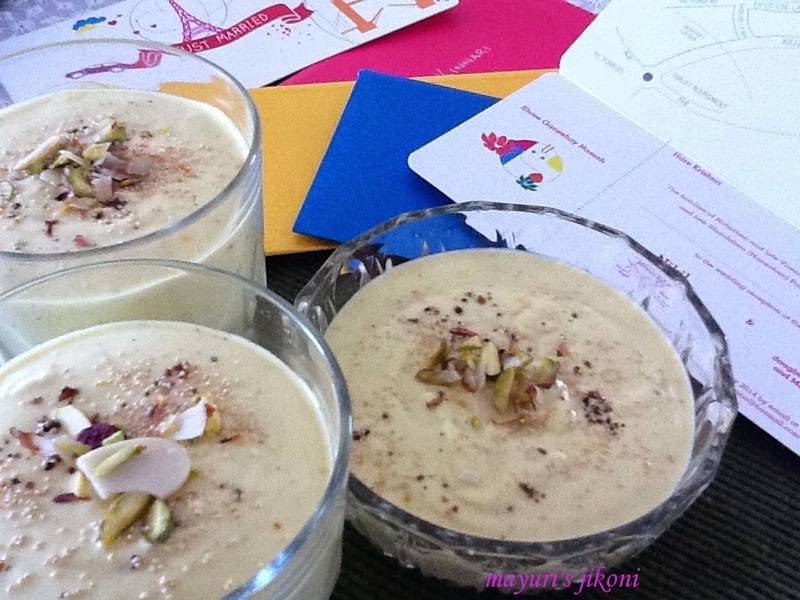 looks so awesome…and an interesting recipe…thank u so much for linking to my event and looking for more….